It's great if you need a bit of inspiration or a recipe as you can search through what other people have pinned, giving you a kind of filtered Google where people have only pinned what's good! There's a good bit of humour on there as well and one of my favourites is when people try to make something they've seen on Pinterest and fail with the caption "nailed it" under it. 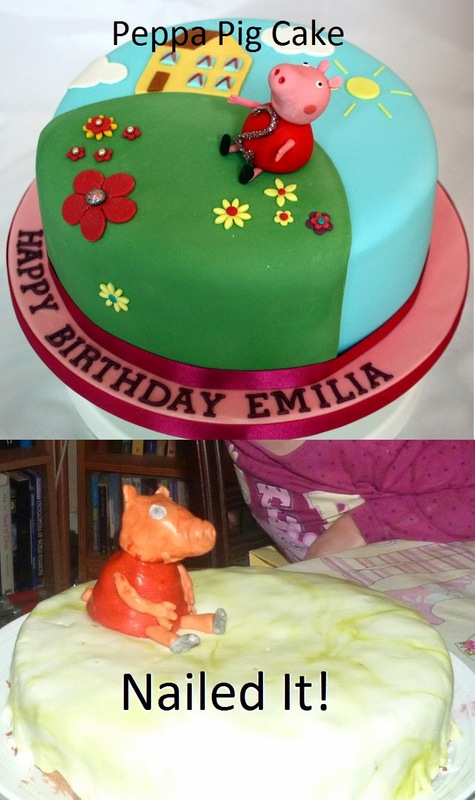 So I thought I'd add my offering to the ranks and have the Peppa Pig cake as something to make someone smile. Feel free to pin it to any of your boards! I know now that I used the wrong food colouring and that's what made her it slump and look like she'd been on the fake tan. It makes me chuckle though! Next time I'll have to make a cake with a little less ambition! Search for An English Homestead on there to find and follow me and I'll do the same back if you have things I like pinned. I used the liquid type and it just makes it all wet and slimy. Made me laugh when I finished it though! That made me chuckle! Sort of pork crackling colour methinks! Kind of "you know when you've been tangoed!" I couldn't make one any better. Your pig reminds me of one of the Clangers. Do you remember the Clangers and dear old soup dragon, Kev? I'm still convinced it's perfect! I don't think the pig looks so bad. Just not the pig it was meant to be! from a distance maybe. ..
Kevin, it's WONDERFUL and your daughter will LOVE it!!!! No it's not! It's funny, don't worry I'm fine with it - my kids still loved it. My project on tomorrows post is rather great though - wait until you see that! Cake? I used a cushion! ermmm well LOL on the cake... I LOVE pinterest! I will find ya on there. Cool, I'll follow you back! I'll get better with the cakes I promise! Excellent, hand made by Dad ....THAT is the magic of this cake. She does look like she's been roasted for a couple of hours though!! Thanks for visiting my blog and making me laugh Kev! Like you said, at least you tried!